You knew Joe if you shopped at the Co-op. He was the sausage-making meat expert in the butcher area. You knew Joe if you worked at the Co-op. He kept a constant eye on management and was a leading advocate for the union. He spent many a year trying to get better situations for employees, which paid off in recent years with a succesful union vote. 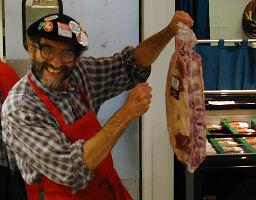 He and sidekick Laura kept us laughing at the old meat counter before the new building. Joe had other sides, too. In particular, he was an artist. Frequently he’d glide up to us and slip us a new creation – handmade cards of his own design, with intricate, old-fashioned style prints. We have the full collection to this day. He was smart, well-read, and always interesting in conversation. Brattleboro was a better place for having him around, and has lost one of “those people” who make this place a great place to live. I worked with him for over a decade. He was a gentleman and a scholar. Funny, kind, full of decency and righteous outrage. We’re all diminished by his loss. Joe was dedicated to helping people receive fair treatment. I will miss his wisdom and insight into what really matters. He was one of the few people that was an instant connection. I could count on him to tell me what was really going on in the coop. In the last few years his ability to share his point of view increased and was a lucid voice in a confusing time in our country. I had know him since 1992. Thank you Joe for your friendship. Friends and family are gathering at 11 a.m. Saturday, November 3, at Guilford Community Church, Bee Barn Rd, Guilford.